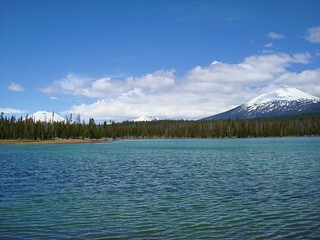 Lava Lake with South Sister on the left, then Broken Top and Mount Bachelor on the right. In the Deschutes National Forest near Bend, Oregon. The Mount Bachelor volcanic chain, southeast of South Sister, consists of Mount Bachelor itself and a series of cinder cones, lava flows and three shield volcanoes. The northernmost shield is capped by a steep-sided summit cone of Mount Bachelor. Minor explosive activity built the many cinder cones which fed the many lava flows that account for the bulk of the erupted material.